It’s something we never want to see, but with increased shipping and oil development in a warming Arctic, there’s a real chance of an oil spill. In a move that imperils an already endangered animal, North Carolina officials are allowing night-hunting of coyotes with spotlights and artificial calls in red wolf territory. With their similar colors and size, red wolves and coyotes are difficult to tell apart. Defenders filed a court challenge in September to end coyote hunting in the red wolf recovery area, arguing that the agency is violating the Endangered Species Act by allowing hunters to harm wolves. Only about 100 red wolves exist in the wild—and between 2000 and 2013, 29 percent of the population was killed by gunshots. Drought and habitat destruction from energy development and agriculture are decimating a grassland grouse that once ranged widely beside bison, pronghorn and prairie dogs on the southern Great Plains. In just one year, the lesser prairie-chicken’s population has declined by 50 percent, according to a recent report from state wildlife agencies. Active breeding grounds—called leks—also suffered a 30 percent decline. 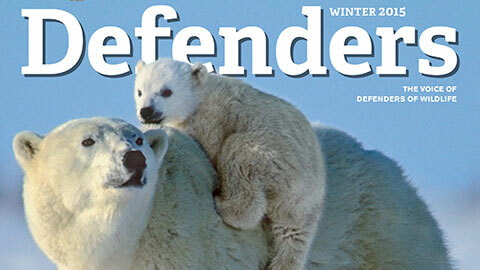 This adds new urgency to protect the bird under the Endangered Species Act (ESA).“These birds are struggling in the face of accelerating habitat loss, a dangerously small population size, more frequent droughts and fragmented range,” says Mark Salvo, Defenders’ federal lands policy analyst. “The recent sharp decline is a clear indicator that their time is running out. 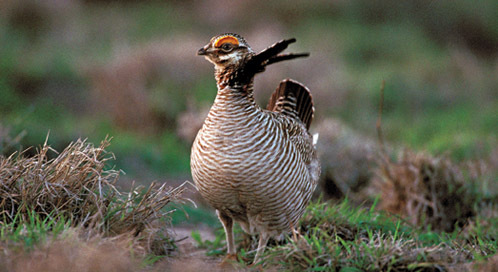 Under the ESA, we can provide the prairie-chicken the help it needs while rewarding conservation efforts by landowners.” The U.S. Fish and Wildlife Service determined listing the species was warranted in 1998. A final decision is expected in March.